Henri Paul Payfer, pionner, was the son of André Payfer and Christine Fouin who stayed in "New Germany". For more on his parents' names, press ICI. He was born in "New Germany" around 1739. TO SEE MAPS OF THE AREA, PRESS HERE He died May 11th 1784 at Sainte-Geneviève de Pierrefonds and was buried on the 13th in the church in line with the belfrey. He was then a lieutenant in the militia. (This Act is found further down.) For more and his relatives and their "visits", press HERE for a translation of a text from Mémoires written by Louis Richard. Henri Paul married in Sainte Geneviève de Pierrefonds on February 2nd 1761 Marie Catherine Éthier, daughter of Joseph Éthier and of the late Marie Catherine Lauzon. (This Act is found further down.) Only the groom could sign. Were presents: Nicolas Claude, François Janevri, Paul and Gabriel Éthier. Father Besson officiated. The following note is found on the site of the Université de Montréal's Genealogical Site: "This act is also found in the archives of the Protestant Church of Québec." For more on the family of Marie Catherine Éthier, press HERE. Marie Catherine was born on December 1st 1743 at Sainte Geneviève de Pierrefonds and baptized the following day by the Missionnary Father Faucon. Her godfather and godmother were Joseph Rouleau and Marie Anne Lauzon, both of Sainte Geneviève. Widowed, she married Jean Baptiste Lanthier. She died at Saint-Eustache on April 7th 1814 and was buried the following day. 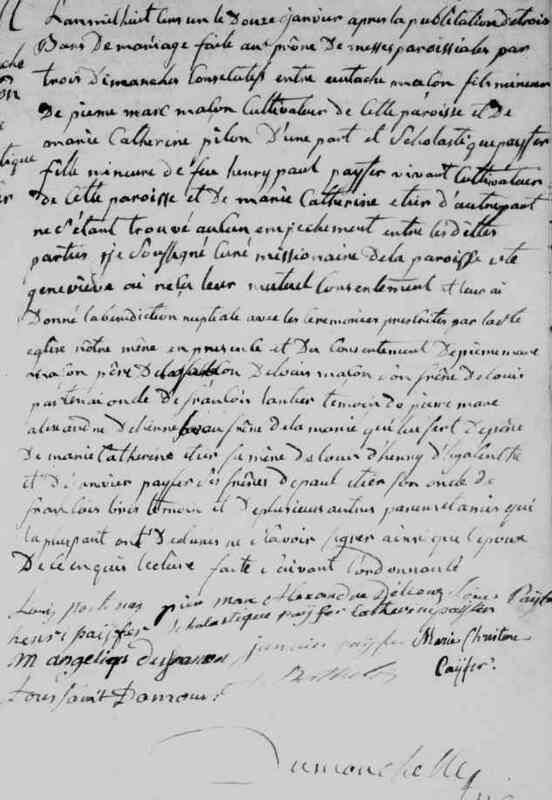 Henri Paul André and Marie Catherine had also agreed to a Marriage Contract written by the Missionnary Priest Besson also on 2nd January 1761 which was then deposited to the Minutes of Notary Panet de Méru on 17th April. To see this Act, its transcription and translation, press HERE. In this contract, the bride's father gives to the spouses 400 pounds and the groom declares his ownership of a house in Sainte-Geneviève on a 3 acres lot. The spouses choose to be married with a communal estate settlement, which means that all they own either now or in the future will be communally owned, and as this contract is under the Coutume de Paris, under the husband's exlusive financial control. For more on the Coutume de Paris, their Marriage Contract and its consequences, press HERE. Marie Catherine Payfer, born at Sainte-Geneviève-de-Pierrefonds on November 15th 1761 (This Act is found further down. ); she married there on September 11th 1780 with Marc Alexandre Delienne Bélanger, son of Alexandre Delienne Bélanger and of Jeanne Martineau. (This Act is found further down.) Also earlier on the same day, the future Spouses signed a Marriage contract in front of Notary Soupras; among those who signed the Act were her father Henri Paul Payfer and her brother Louis Payfer as well as the bride and groom (To see this Act and its transcription, press HERE). She died at Sainte-Geneviève on April 7th 1825 and was buried on the 10th (This Act is found further down.). Marie Christine Payfer, born in Pointe-Claire on August 28th 1766 and baptized the next day (This Act is found further down. ); her godparents were the blacksmith Toussaint D'Amour Poitevin and his wife and her aunt Marie Louise Éthier. 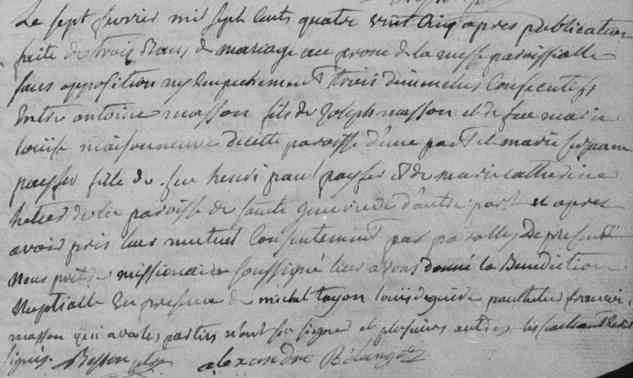 She married at Sainte-Geneviève de Pierrefonds on January 22nd 1787 François Rochon Rocheron, son of François Rochon Rocheron and of Marie Charles Prévert (This Act is found further down. 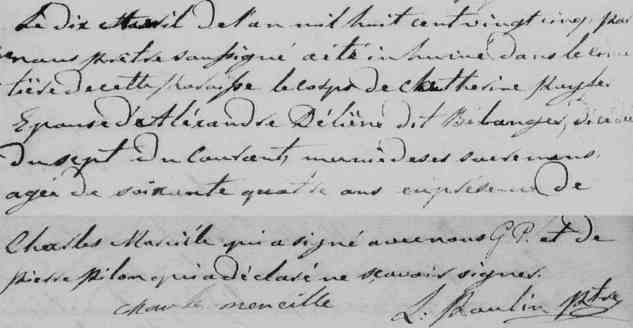 ); the bride signed as well as her brother-in-law Alexandre Delienne Bélanger She died at Saint-Eustache on April 11th 1823 and was buried on the 13th (This Act is found further down.). 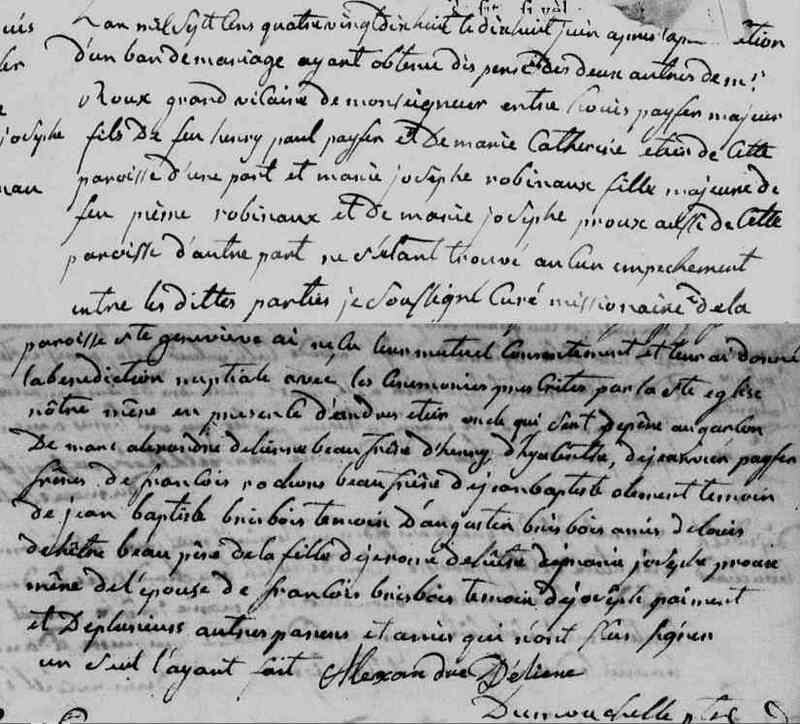 Marie Suzanne Payfer, born and baptized under condition as she had been baptized in an emergency by the midwife that same day, at Sainte-Geneviève de Pierrefonds on September 10th 1767 (This Act is found further down. ); her godparents were Jean Baptiste Toupin and Suzanne Lalande. 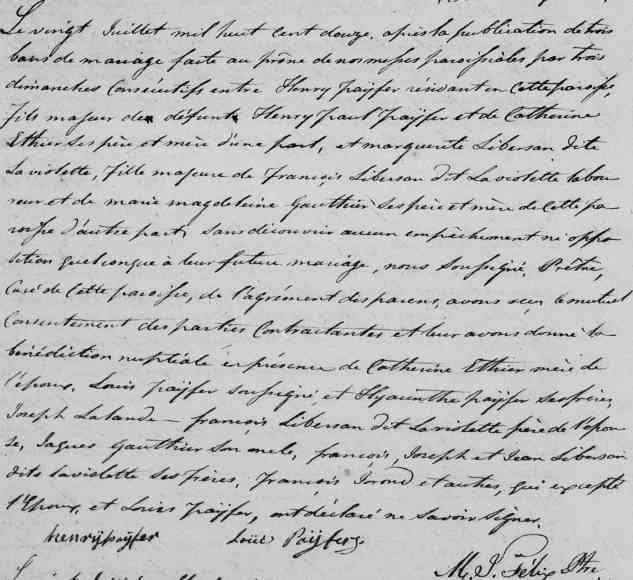 She married at Saint-Eustache on February 7th 1785 Antoine Masson Dutremblé, son of Joseph Masson Dutremblé and of the late Marie Louise Maisonneuve (This Act is found further down. ); only her brother-in-law Alexandre Delienne Bélanger signed. She died at Saint-Eustache on March 8th 1823 and was buried there the 10th (This Act is found further down. ); Jean Baptiste Masson signed that Act. Louis Payfer, born and baptized on October 26th 1770 at Sainte-Geneviève de Pierrefonds (This Act is found further down. ); his godparents were Louis Brisebois and Angélique Chauret. He married there June 18th 1798 Marie Josephe Robineau Desmoulins, daughter of the late Pierre Robineau Dumoulin and of Marie Josephte Proulx (This Act is found further down. ); only his brother-in-law Alexandre Delienne Bélanger signed. He died at Saint-Eustache on February 21st 1839 and was buried there the 23rd (This Act is found further down.). Marguerite Payfer, born at Sainte-Geneviève de Pierrefonds on 24th August 1772 and baptized the next day (This Act is found further down. ); her godparents were Joseph Hilaire Martin and Marguerite Hubert. She married at Saint Eustache on 21st October 1793 Pierre Duquet Madry, son of the late Joseph Duquet Madry and of the late Elisabeth Charbonneau (This Act is found further down. ); among those who signed were Marguerite Hay, her brother Louis Payfer, her sister Catherine Payfer, Joseph Cheval, her sisters Christine and Scholastique Payfer, her brother-in-law Alexandre Delienne Bélanger, Joseph Lapointe, C. B. Gagnier, Paul Éthier, Lafleur et Globensky. she died a widow at Sainte-Geneviève and was buried there October 29th 1798 (This Act is found further down. ); her brother Louis Payfer signed the Act. Her husband had been buried at Saint-Eustache on July 5th 1795 aged 24 years (This Act is found further down.). It follows that their marriage only lasted twenty months and a few days. They had at least one child, Pierre Paul Duquet Madry, who died at Saint-Eustache on 22nd April 1814 at the age of 18 years and was buried the 24th. 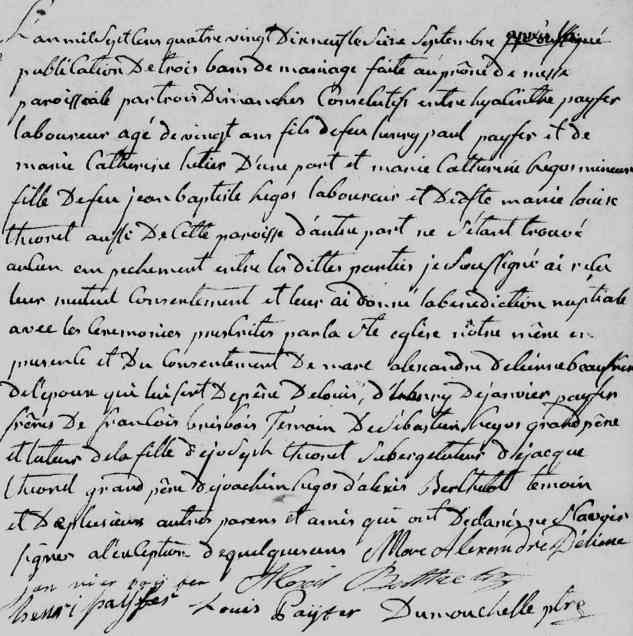 Henri Paul Payfer, born and baptized at Sainte-Geneviève de Pierrefonds on 22 September 1776 (This Act is found further down. ); his godparents were André Éthier and Geneviève Proulx. He married at Saint-Benoît on 20 July 1812 Marguerite Libersan Laviolette (This Act is found further down. ); he died at Saint Clément de Beauharnois on April 19th 1854 and was buried on the 21st (This Act is found further down.). Hyacinthe Payfer, born at Sainte-Geneviève de Pierrefonds on May 7th 1779 and baptized the next day (This Act is found further down. ); he married there on 16th September 1799 Marie Louise Catherine Legault Deslauriers, daughter of the late Jean Baptiste Legault Deslauriers and of the late Marie Louise Théoret (This Act is found further down. ); among those who signed the Act were his brother-in-law Marc Alexandre Delienne Bélanger, his brothers Janvier, Henri and Louis Payfer. He died at Saint Benoît on July 10th 1816 and was buried on the 12th (This Act is found further down.). 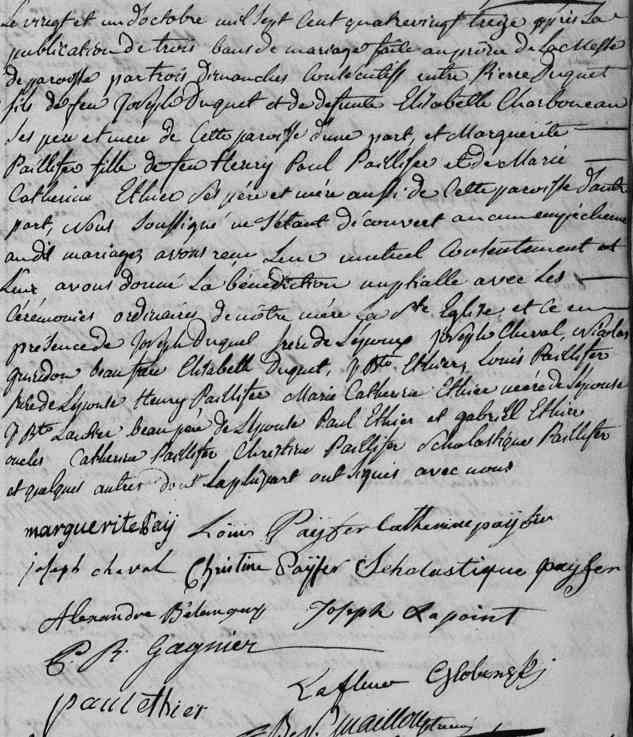 Alexandre André Janvier Payfer, born in Sainte-Geneviève de Pierrefonds on January 1st 1781 et baptized the same day; his godparents were his uncle and aunt Alexandre Delienne and Catherine Payfer (This Act is found further down.) he married in the L'Annonciation Parish of Oka on the 23rd of November 1802 Josephte Antoinette Lemaire Saint-Germain, daughter of Ignace Saint-Germain and of Marie Louise Rose Castonguay (This Act is found further down. ); among those who signed were the bride and groom, his brother-in-law Alexandre Delienne Bélanger, and her father. Scholastique Payfer, born and baptized in an emergency at Sainte-Geneviève de Pierrefonds on February 8th 1782 and whose baptism rites were completed on the 21st (This Act is found further down. ); her godparents were a Paiement and her sister Christine Payfer. She married at Sainte-Geneviève de Pierrefonds on January 11th 1801 Eustache Masson, son of Pierre Marc Masson and of Marie Catherine Pilon (This Act is found further down. ); among those who signed were her brother-in-law Pierre Marc Alexandre Delienne Bélanger, her brothers Louis, Henri Payfer, her sister Catherine and Marie Christine Payfer, her self, Marie Angélique Dufresne, and her brother-in-law Toussaint D'Amour. She died in Montréal on October 25th 1845 and was buried on the 28th in Notre Dame Church (This Act is found further down. ); her sons Wilfrid and Jean Baptiste Masson where among those who signed. During his life, Henri Paul Payfer wrote and signed many contracts. Among them, the sale of a piece of land to Marie Joseph Proulx. This act was written on 28th May 1763 by the Father Reverchon, and was registered on 7th May 1770 by Notary L.-J. Soupras. Some lines were written by Henri Paul where he acknowledges receipt of this or that sum as partial payment. To see this Act and its transcription, press HERE. 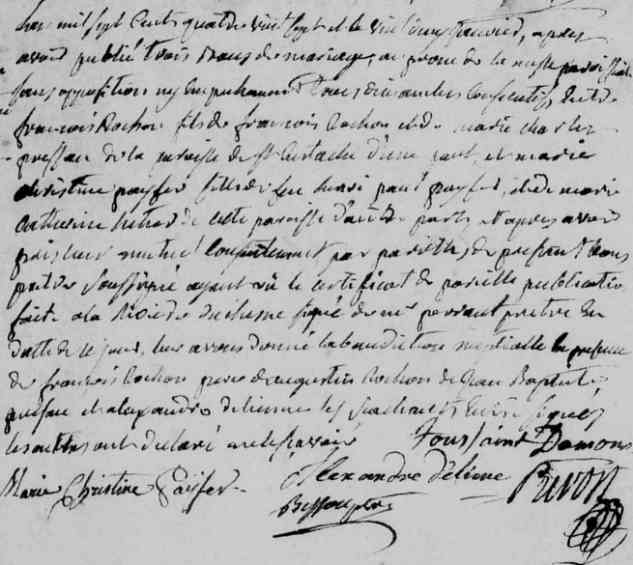 There is also an agreement about the use of a piece of his land by Marie Angélique Brunet, widow of Antoine Villeray during her life, agreement Henri Paul wrote on July 4th 1764 and was registered by the Notary Soupras on the 31st. To see this agreement and its transcription, press ICI. According to the first census under British Rule, made in 1765, he had 90 arpents of land on which was a house. He did not have any of his land sown, and owned no horse nor sheep, but four pigs, two cows and two she-calves. 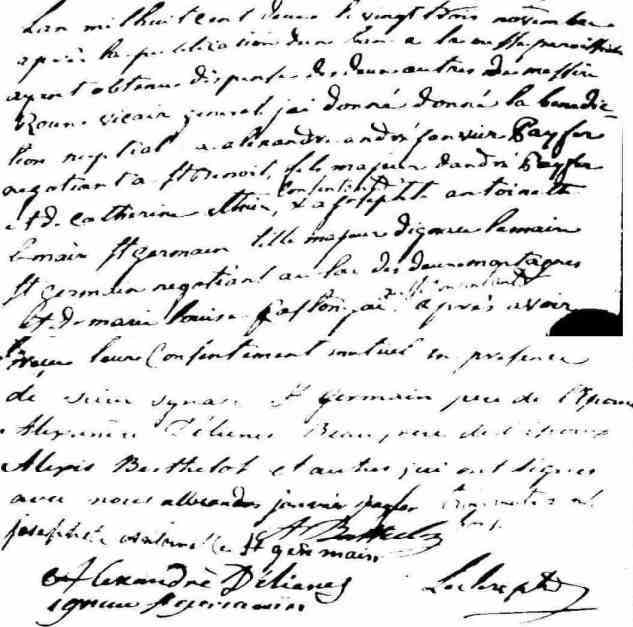 Henri Paul sold part his land to his brother-in-Law Toussaint D'Amour Poitevin on September 27th 1774 and the rest on April 28th 1783 To see this Act and its transcription, press ICI. He bought from his son-in-Law Marc Alexandre Delienne Bélanger a lot with a stone house built on Saint-Louis street on May 5th 1783. To see this Act and its transcription, press ICI. It is in that house that Henri Paul Payfer died on 11th May 1784 and was buried inside the Parish church on the 13th. As he had lived with his wife according to a communal estate settlement according to his already mentioned marriage contract, his wife and heirs requested in inventory of the community's assets and liability. This inventory took place on 26th May 1784. To see this document and its transcription, press HERE. In it, the list of the heirs is established: eight under aged children and the oldest, of age, Marie Catherine Payfer, who was married in a communal estate settlement with Marc Alexandre Delienne Bélanger who, as husband, was to decide in his wife's name. Following this, his widow Marie Catherine Éthier took the decision to relinquish the communal estate agreement on June 7th. To see this document and its transcription, press HERE. This is hardly surprising as she could not keep her husband's business going as she could neither read or write. Marc Alexandre Delienne Bélanger in his wife Marie Catherine Payfer' name, took on the same day the decision to renounce her share of the inheritance as his involvment in it would have been more trouble that it was worth. To see this document and its transcription, press HERE. The succession being in abeyance, Toussaint D'Amour, husband of Marie Catherine Éthier's sister Marie Louise Éthier, was made trustee. There was some problems between him and the widow as she sued him as trustee for the sum of £56 5s. The case was heard on June 19th 1784 and Marie Catherine Éthier won. The trustee Toussaint D'Amour had to pay the whole amount demanded plus costs, a sum of £5 11 s. To see the decision and its transcription, press HERE. For the Family of Marie Suzanne Payfer and of Antoine Masson Dutremblé, press HERE. For the Family of Scholastique Payfer and of Eustache Masson, press HERE. For the Family of Louis Payfer and of Marie Josephe Robineau Desmoulins, press HERE. For a search of Heny Paul Payfer' relatives in New Germany, press HERE. For the lineages of the males with the Payfer Name in Québec, press HERE. Le quinze novembre mil sept cent soixante un a été baptisée marie catherine née le meme jour fille légitime d'henri paul payfer et de catherine hetier habitants cette paroisse la marrène a été Decarie Joseph corbeïl qui a déclaré ne savoir signer de ce enquis.